Octego Ltd are specialist screed contractors working in Hayward Heath, throughout West Sussex and across the South East. With more than 40 years of experience, we have developed a fantastic reputation for completing high quality work on time and on budget. If you need to have commercial screeding work carried out at your premises, don’t hesitate to get in contact with us today by calling 01444 405269 and speaking to a friendly member of the team who will be happy to talk through all the details with you. A family-run business with a wealth of knowledge and practical expertise, we offer a comprehensive package incorporating the fit-out of all kinds of workspaces as both project managers and main contractors. Good quality screeds lay an important base for your flooring, so it’s important to get this right. 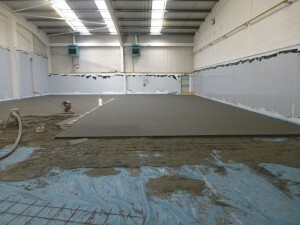 We have the experience of carrying out professional screeding works on a huge range of sites, industrial premises and other commercial buildings across Sussex and the South East. You can count on us to do a fantastic job. As our team has experience in all forms of construction and renovation we are happy to take on broader projects across industrial and commercial premises. So please feel free to discuss your needs with us. With 40 years’ experience as resin flooring contractors, we are experts when it comes to applying floor screeds and ensuring a high quality finish every time. We use our vast knowledge and expertise to adopt project managerial roles from to start to finish so that we can guarantee the work is completed within the guidelines you have set and to your specific requirements. Once we have completed your screeding works we also have the ability to deal with any other flooring requirements you may have. Talk to our friendly team about the work you need done. We can apply our very own polymer modified screeds prior to receiving any complete floor finish. Once we’ve done this, we overlay with resins, soft flooring or tiles depending on your preferences within a 40 hour period. In order to provide the screed with more strength and to help prevent any movement we can also add fibres and steel meshing reinforcements. To find out more about screeding or to learn about our extensive range of building and maintenance services here at Octego Ltd, please do not hesitate to get in touch. Call our specialist screed contractors on 01444 405269 to find out more.